ALIO Oil-free Reed Diffuser and Scented Diffuser Pouches are the first of their kind. Our natural wood resin reeds and beads are infused with a powerful odor neutralizing technology and subtle, fragrances that eliminate unpleasant odors and freshen the air around you. say hello to modern home air care…say hello to alio! Our all-natural wood resin reeds are infused with a powerful odor neutralizing technology and subtle, custom blended fragrances that eliminate unpleasant odors and freshen the air around you. Oil-free means, mess free. With our patented fragrance infused reeds there is no chance of a sticky mess and no need for oil refills, just simply flip the reeds weekly to refresh! ODOR NEUTRALIZING CLEAN AIR CARE - Our patented odor neutralizing formula eliminates unwanted odors. FRAGRANCE INFUSED - Our custom blended scents are crafted to be soft & subtle. Alio reeds are not intended to mask odors but to neutralize odors and leave behind a delicate fragrance. VERSATILE – Alio reeds can be used individually in small spaces like drawers and gym bags for a little freshening up! ECO-FRIENDLY The alio vase and reeds are made from all-natural wood resin sourced from sustainable forests. MADE IN THE USA - Alio is a USA family-owned business that wants you to be happy and odor free! Alio Oil-Free Diffuser set includes: one signature vase & one set of 15 odor neutralizing, fragrance infused diffuser reeds. Our all-natural wood resin reeds are infused with a powerful odor neutralizing technology and subtle, custom blended fragrances that eliminate unpleasant odors and freshens the air around you. For the kitchen…fresh cucumber. Next to the bed…Lavender Beeswax. In those stinky gym shoes…Cedar & Teak. Neutralize odor and leave a hint of scent with alio fragrance infused reeds. We utilize patented odor neutralizing technology to help give your space a breath of fresh air! 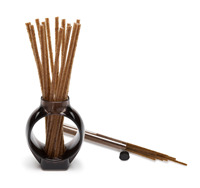 Alio Reeds can also be used in our signature vase or individually and placed in any area in need of odor neutralization and a hint of fragrance. Oil free means, mess free. With our patented fragrance infused reeds there is no chance of a sticky mess and alio reeds leave no residue. Alio reeds last for 30 days. When it’s time for a change, simply fill your vase with a refill set, in one of our 12 exclusive fragrances. ECO FRIENDLY Made from all-natural wood resin sourced from sustainable forests. Alio Oil-Free Reed Refill includes: one set of 15 diffuser reeds in your choice of one delicate, custom blended fragrance. Our all-organic pouches are filled with wood resin beads, infused with a powerful odor neutralizing technology and subtle, custom blended fragrances that eliminate unpleasant odors and freshen the air around you. The alio diffuser pouch utilizes patented odor neutralizing technology to remove unwanted odors. The alio pouch does its best work in small spaces in need of odor neutralization and a hint of fragrance, like gym bags, linen closets and even inside those stinky running shoes! FRAGRANCE INFUSED - Our custom blended scents are crafted to be soft & subtle. Alio pouches are not intended to mask odors but to neutralize odors and leave behind a delicate fragrance. ECO-FRIENDLY The alio beads are made from all-natural wood resin sourced from sustainable forests and our pouches are made from all organic cotton.